Etsy has been around for many years and is the “go to” place for handmade sellers. There are definitely pros and cons for selling on Etsy. If you have a handmade product you may want to weigh each before jumping in. Good Reputation. Etsy has been around for a long time. Buyers have bought. Sellers have sold. It has been proven. Most people who do online shopping have heard of it. Free to Join. Having a business costs money. So the fact that you can set up an online store for free is definitely a bonus. Low Cost to Run. Etsy takes care of the technical issues for you. You don’t have to have your own tech team for your online store. Trusted by Shoppers. It is really important for online shoppers because credit card information in the wrong hands is an identity thefts dream. Shoppers trust that their financial purchases will be protected. Easy Way to Start Selling Online. 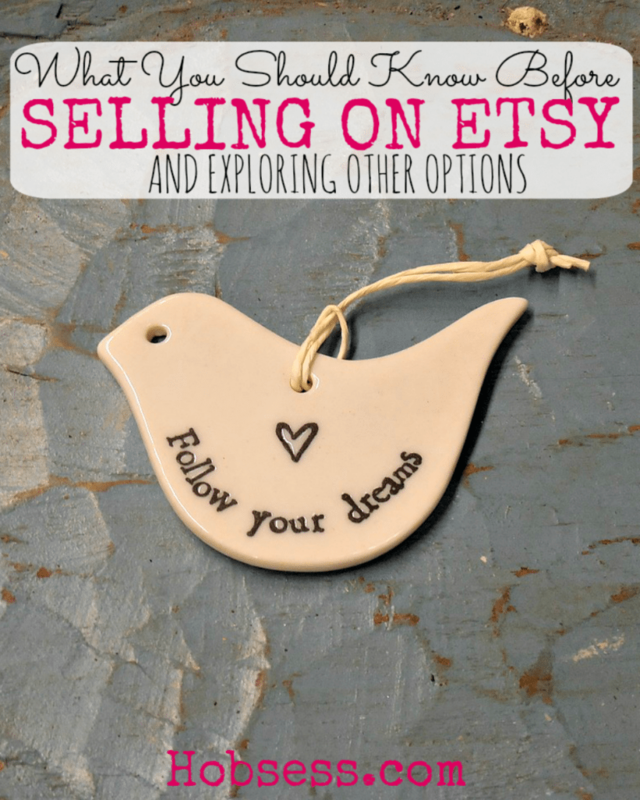 If it is your goal to sell your products online, Etsy is one of the easiest ways to start today. They need you and want to make it as simple as possible. Great Brand for SEO. Etsy is a trusted site so Google and other search engine sites love it. You still have to do your part using keywords in your descriptions and images but once done, the search engines will help. User-Friendly. As I mentioned before, they need you. Etsy is nothing without sellers. They try to make it as easy as possible for you to set up your store. Supportive Community. You are not alone. Have a question? Learn from other Etsy sellers. It’s International. You could be selling your handmade products to customers on the other side of the globe. Very cool. Allows Seller to Sell Digital Products. Let’s say you sell doll dresses. You can expand your reach and also the pattern to make the dress. Your business could grow twice as fast with more options for customers. Over 1 Million Shops. Talk about a small fish in a big pond! That’s a lot of competition. Ever Changing. You are at the mercy of Etsy since you are using their site. So whenever they decide to change ANYTHING from technical issues to the number of fees they collect from each of your sales, you have to comply. Time Consuming. It will take you some time to take professional-looking photographs of each of your items for sale, write engaging descriptions, add keywords and upload. The more time you spend making your items attractive to customers, the greater the payout. But it takes time. Big Learning Curve. While Etsy is free and they try to make setting up your store as easy as possible, there is the natural learning curve that will occur. If you have spent the time on your storefront to make it as engaging as possible and you still are not attracting customers, what are you going to do next? That’s right. Research and learn how to get customers, how to sell, handling customer service and more. Required Perseverance. It would be great if you could set up your store, forget about it and the orders start rolling in, but that isn’t what happens. You will have to find out what it takes to be a high performing Etsy seller and that means spending time, effort and additional resources to make it happen. Fees Add Up. Joining and setting up a shop on Etsy is free. Each item listing on Etsy costs $0.20 USD when the listing is published. A listing lasts for four months or until the item is sold. Once a sale occurs, we assess a 5% transaction fee on the item’s sale price (info comes from the Etsy site). In addition, there is a 3% + $0.25 payment processing fee. Sometimes the Community is More about Sellers trying to Sell to You Than Helping. This is true in so many industries. People come across as trying to be “helpful” but really their only interest in you is that you buy their stuff. Must Do Your Own Marketing. While Etsy 10 years ago, made the early adopters profitable since there were so few sellers, today is a different story. You must be prepared to do your own marketing with either a separate website, craft fairs, networking, social media, etc. With so many options, one of these sites might be a better use of your time. You may have a better experience with another venue since you are going to have to market your store anyway. Also, don’t forget that you can sell your products at a local craft fair. Happy researching and let me know in the comments below where you have decided to sell your handmade goods. Here’s to your successful business!